When I went backpacking in Europe, I only had 70 days and had to miss Portugal. I heard so much about it and would have wanted to go around there for a couple of weeks. I was glad when a fellow blogger, Mimi McFadden, offered to write an article about backpacking in Portugal for my site. From the picturesque north with its rolling vineyards and dark port cellars, to the bustling cosmopolitan Lisbon and all the way down to the sunny shores of the Algarve, Portugal has a lot to offer for any backpacker. 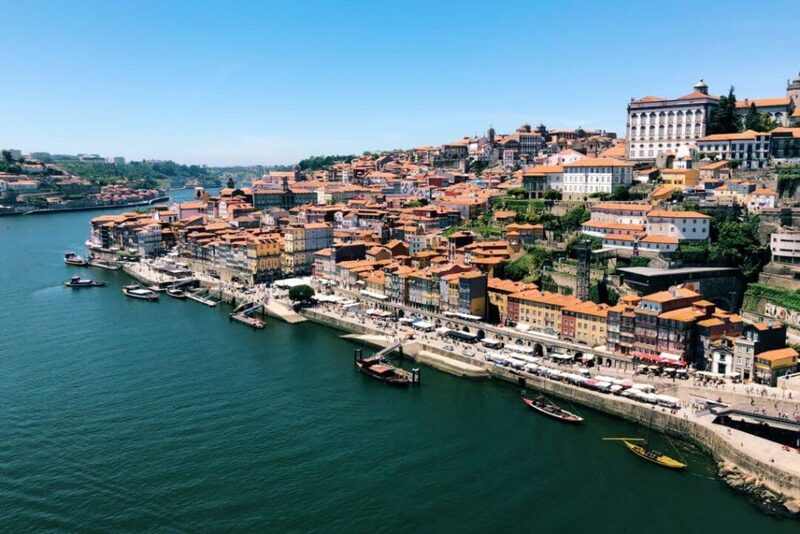 Since the planning stages of any trip can be stressful and time consuming, I want to make it easier for you through laying out everything you should know before your Portugal travel. 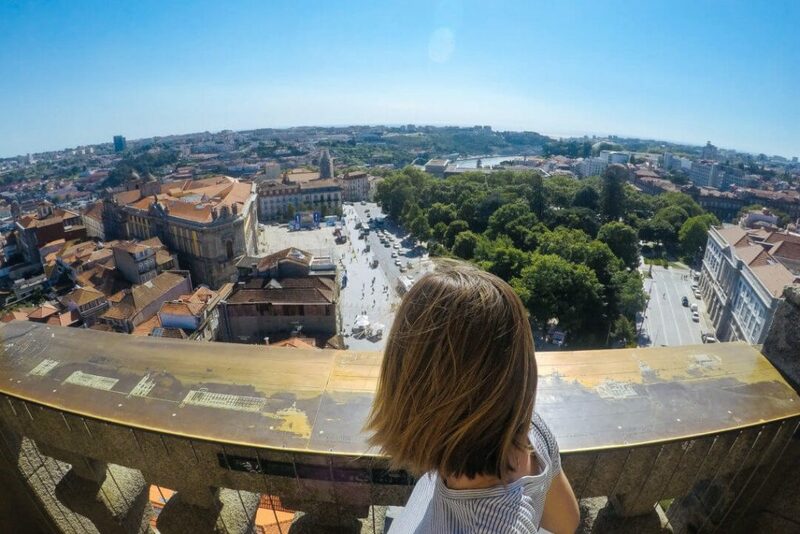 Read through these tips ahead of your Portuguese adventure so you can focus on a trip that is just as epic and fun as you hoped it would be, without stressing about not being prepared for what to expect. Because to be completely honest, Portugal has a lot of surprises — at least for me. As you start putting together your itinerary for your backpacking trip through Portugal you’ll want to make sure you’re planning for more than just what you’re going to be seeing and doing, but also when and how you’re going to do it. The beautiful coastal town of Porto. Since Portugal is in southern Europe, it’s hard to visit at a bad time. The average temperature hovers around 20 degrees Celsius year around, with summer temperatures roughly in the 21 to 27 degrees (especially along the coast) and winter temperatures dipping to the 10 degrees. The winter and spring seasons are usually more rainy, but packing a light, breathable raincoat will come in handy no matter when you’re visiting. If you’re traveling a little more inland or through the mountains it will be a cooler than the temperatures you get along the coast. Going on a summer trip? Just be prepared for a lot of tourists! How much is it to travel around Portugal? Portugal’s standard unit of currency is the euro. You can exchange currency before leaving home or wait until you get there. My top tip as a backpacker is always to take out cash from an ATM at the airport once you arrive, as opposed to going to a currency exchange, to cut down on fees. Make sure to keep a small amount of cash on you throughout your trip in case of emergencies. I generally have the equivalent of US $200 in random places of my luggage at all times in case I run into issues with getting money out or my purse gets stolen. One thing to note about Portugal is that a lot of establishments won’t accept a Visa or Mastercard, only a Portuguese credit card, so you’ll want that cash just in case! If you do end up going to a restaurant, make sure you ask what kind of payments they accept before you’re seated. The good news is that Portugal is very affordable, especially compared to neighboring countries like France and Italy. You likely won’t find yourself breaking the bank during your trip. A lot of the dining and drink options are priced quite modestly, even in metropolitan Lisbon. Two words – get it! Purchasing a good travel insurance plan is a must for any travels abroad, even if you are in perfect health and “never get sick.” I regularly use World Nomads for my travel insurance needs as I find them fairly affordable and quick to reply to questions or comments about claims. It’s also a smart idea to roughly mark along your route where the closest medical facilities are in case of an emergency, and to note what the local emergency numbers are in Portugal before you arrive (112). How do you go around Portugal? Like the rest of Europe, Portugal has decent city and country-wide bus and train systems that help make maneuvering around the country much less daunting. However, even though the transit is efficient, Portugal has a long way to go in terms of proper signage at stations. Oftentimes, when you arrive at a station, it’s not overly clear where your bus is meant to leave from. It’s also not common for signs to be in English, so carrying a Portuguese-English language dictionary with you or learning some basic Portuguese phrases go a long way. If you want to make sure you’re never caught trying to catch a train or bus in a pinch you can purchase Portugal rail or bus passes online beforehand since they usually accept international credit cards – something that won’t likely be the case if you try to purchase tickets directly at the station. For trains, you can book tickets ahead of time here. For buses, there are a few different companies that are good. My favorite throughout my time in Portugal was Rede Expressos, which you can book tickets with here. Shelling out a few extras dollars could also make the difference between having things like A/C and a reclining chair if that’s important to you, so make sure you check for those deals. 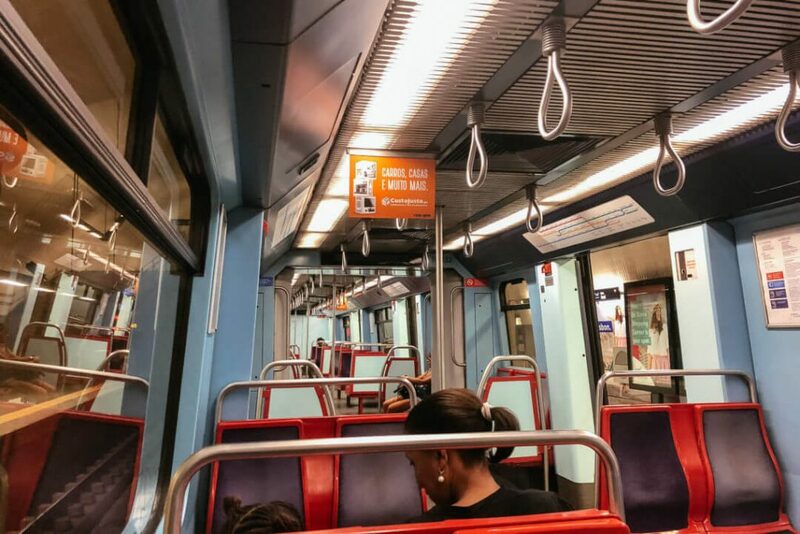 It’s easy to go around Lisbon via the metro. Make sure as well to double check routes, stops, and schedule times before heading out (even better if you take a look while you’re putting your itinerary together). You never know when something might change last minute and you should be prepared if it does. Buses and trains in Portugal don’t wait around for long so being on time is essential. If you don’t want to deal with navigating public transit, another option is to rent a car. 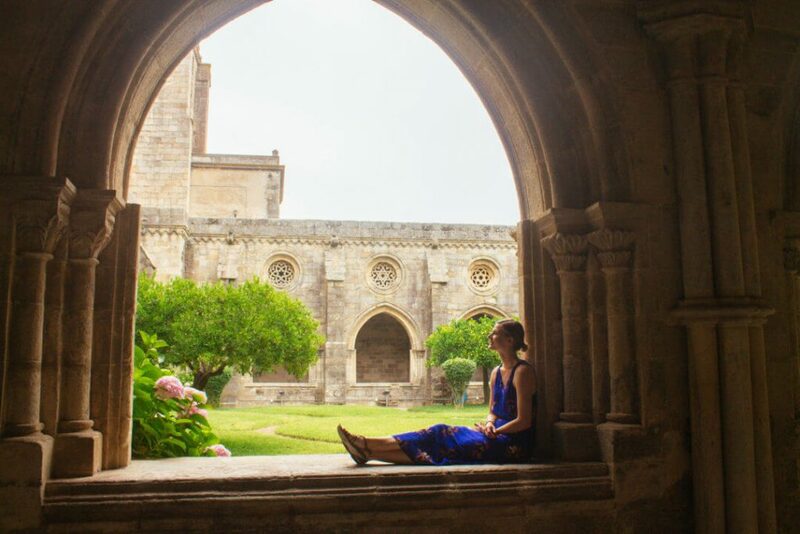 I rented a car for a week-long trip at one point while I was living in Lisbon, and it allowed me to get more off-the-beaten-path and have more freedom with my itinerary. If you drive manual, rental cars are super cheap in Portugal. If you only drive automatic, it’s probably going to be about 3x as much per day, but it could still be worth it depending on your budget and the level of independence you want. If you are interested in renting a car, try and rent from the airport you fly into because that will also cut down a lot on costs. Worried about driving in a foreign country? Don’t be. Portugal is still a sleepy country in a lot of ways and that can be seen most notably on the highways, especially when you get outside of Lisbon. During my one week road trip, there wasn’t ever a ton of cars on the highway (even at the height of summer), and all of the roads were well kept up and easy to navigate with good signage (the opposite of what I found with the public transit). Also, Portuguese drivers aren’t that crazy on the road in terms of speeding and cutting people off – something that I found a lot more common in Spain. Is buying a local SIM recommended for Wifi service? Some people like to keep their local SIM card in their phone and just pay international fees throughout a foreign trip because they think it’s more convenient, but I highly recommend looking into getting a local SIM card in Portugal once you arrive. First off, SIM cards in Portugal are incredibly cheap. Vodafone had a deal throughout my whole summer of living in Portugal, that was only 10 euros for a month worth of unlimited local calls and as much data as I had back home. If you go into any Vodafone, Optimus, or TMN store at the airport or in the Portuguese city you land in, the staff should be able to help with installing the local SIM into your phone (assuming your phone is unlocked). It’s super cheap and simple, so there’s really no reason not to get one. Although Wifi is available at most cafes and accommodations, I always suggest getting a local SIM Card for safety and convenience reasons, especially if your a solo female backpacker. Being able to call someone in case of an emergency or navigate your way out of a sticky situation with Google Maps, is worth every penny. Especially when those pennies equate to 10 euros. What are some safety tips for traveling around Portugal? Portugal is one of the safest countries in Europe with a very low crime rate. Of course, you still need to be sensible and keep your wits about you, especially in an unfamiliar place. As a solo female traveler, I never had any issues walking alone during the day or night in multiple cities around Portugal. Not only did I not have any issues, I never felt uncomfortable or unsafe walking around by myself. 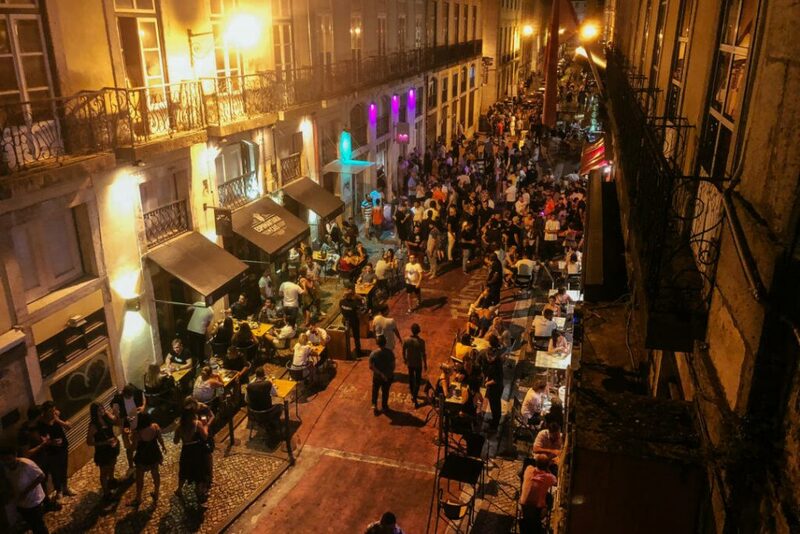 The worst you’ll usually come across is pick pockets or drug dealers in certain parts of Lisbon or Porto, but, like any big city, it’s about educating yourself on the seedier areas of a new city and avoiding them if you’re uncomfortable with the prospect of it being a bit more dangerous. Be smart about where you carry your cash and cards (i.e., a crossbody bag or inner jacket pocket for your wallet are good ideas) and don’t be too flashy with your technology. Be wary of drug dealers when you’re in the bigger cities, they can be persistent (as bad as following you for a couple blocks) but aren’t aggressive and should back off if you tell them no. If you want to swim in the coast, pay close attention to the signs posted on the beach. These signs, sometimes in the form of color coordinated flags, let you know where there are dangerous riptides or surf conditions and where it’s safe to swim. Basically, don’t swim if you see a red flag! What is the language used in Portugal? Portuguese is the official language spoken throughout Portugal, which is very different from Spanish, especially in terms of pronunciation. European Portuguese also sounds very different from Brazilian Portuguese, and even uses completely different phrases at times, so keep that in mind if your knowledge of Portuguese comes from Brazil. That said, most locals in larger cities will be able to speak English and Spanish. Still, it’s a good idea to learn as much of the local language as you can before you arrive. Even just the basics of how to say thank you, hello, good bye, and have a good day, go a long way. Pick up a phrase book and download an app like Duolingo on your phone before you go to prepare yourself better for speaking the local language. What are the best places to visit in Portugal? 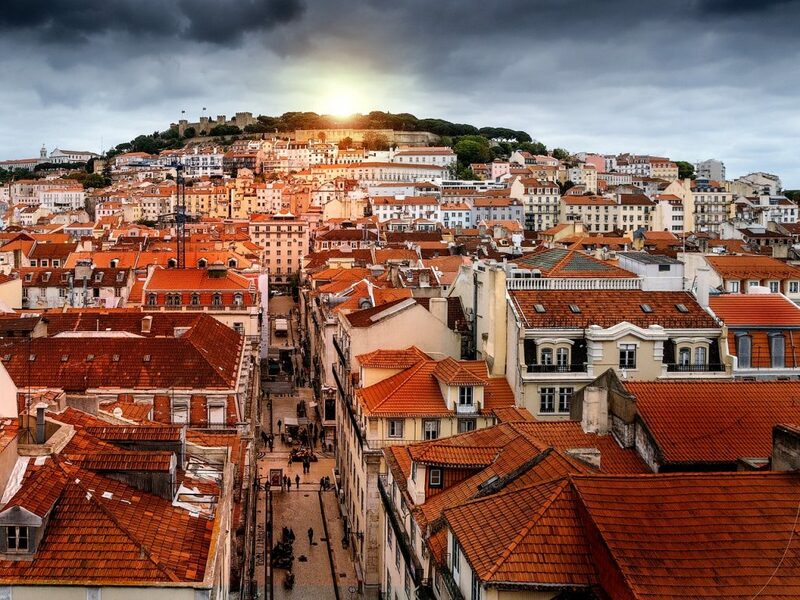 You can’t go wrong by hitting the major cities in Portugal, specifically Lisbon and Porto. 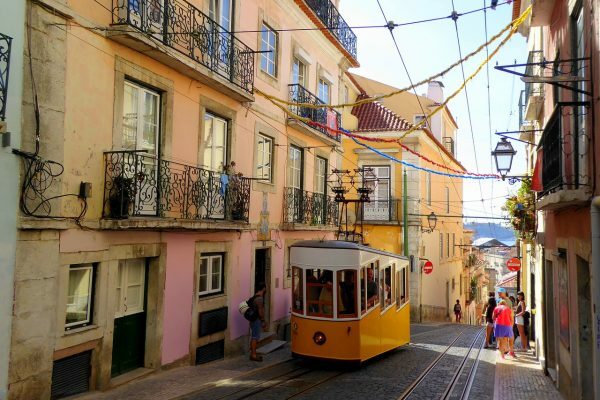 Lisbon, like most European cities, is steeped in history and actually very much resembles San Francisco, California with its hills, cable cars, and replica of the Golden Gate Bridge. Here’s a solo travel guide to Lisbon. And, if you’re spending any time in Lisbon, you’ll have to take at least a day trip to Sintra, the city that is famous for over-the-top castles, such as Pena Palace and Quinta da Regaleira. Porto (and the Douro Valley) is a region known for its excellent Port, wineries, and more upscale style of life. It’s also my favorite city in Portugal and the most beautiful, in my opinion. 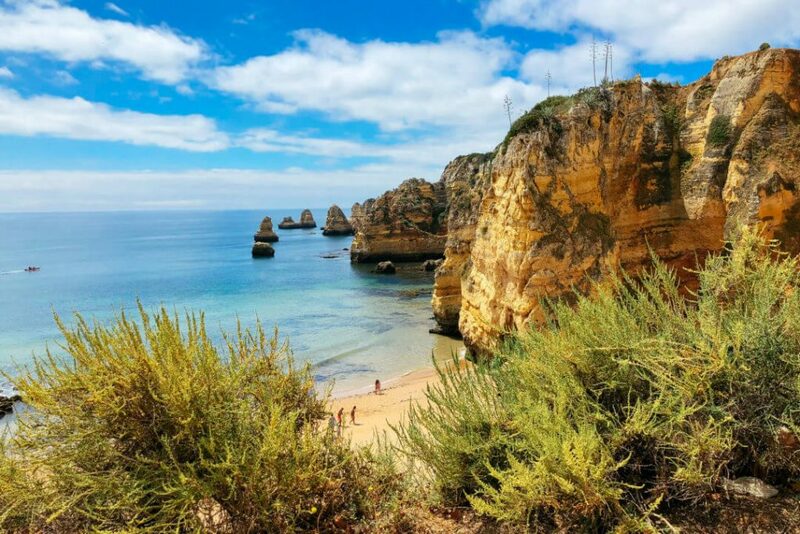 The Algarve is at the top of most people’s list who are coming to Portugal, and it’s definitely worth a visit with how naturally beautiful the region is. Just be prepared for large crowds and a more touristy side to the country, especially in the major Algarve cities of Faro and Lagos. If you’re looking to add in places to your backpacking trip that are a little less touristy and more local, Evora is a city with an incredible architectural influence and history. At the city center is an ancient Gothic-style Roman temple surrounded by whitewashed houses. It’s truly breathtaking. Other favorites that you might want to include are Aveiro (the Venice of Portugal), Coimbra (the ancient college town), Peniche (for stunning seaside views and great seafood), and quiet Tavira (a fisherman’s village on the edge of the Algarve). 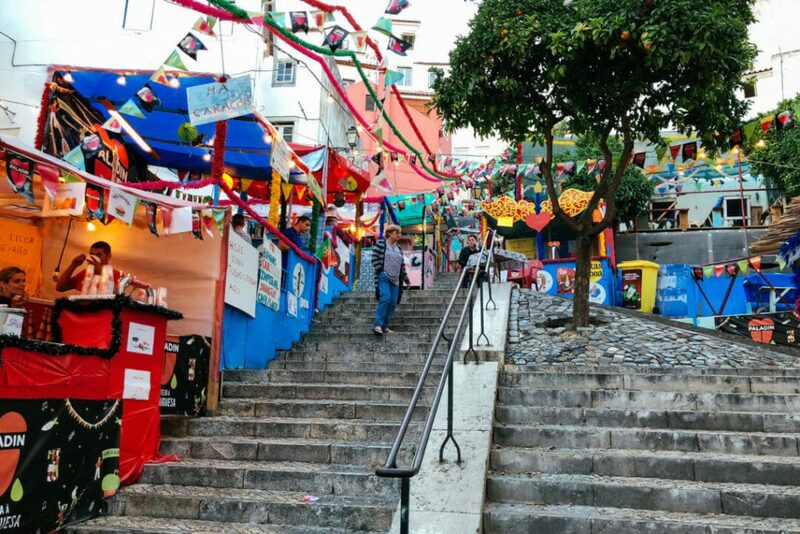 If you’re looking for more tips on this picturesque and lovable country, read the 20 things that surprised me most about Portugal. Cover photo by ©cristinamacia via Pixabay. Mimi McFadden is a travel blogger and freelance writer. Originally from California, she has been slow traveling the world since 2013. When she’s not writing, you can probably find her sipping on a pint of craft beer, chasing waterfalls, or planning her next adventure in a foreign land. You can find her on Instagram, Facebook, and her blog, The Atlas Heart. This is very helpful. I really wanted to know if buying a local sim would be better since it’s a must for us to have internet access whenever we travel. Thank you!